I am wearing the costume. The idea came from the classic Predator movie with Arnold Schwarzenegger. I've been an artist since a very young age and love making things out of nothing. Oh my costumes start off with a store bought masks associated with the costumes idea and then I repaint it cut it put hair on it and keep layering until it looks as real as possible. 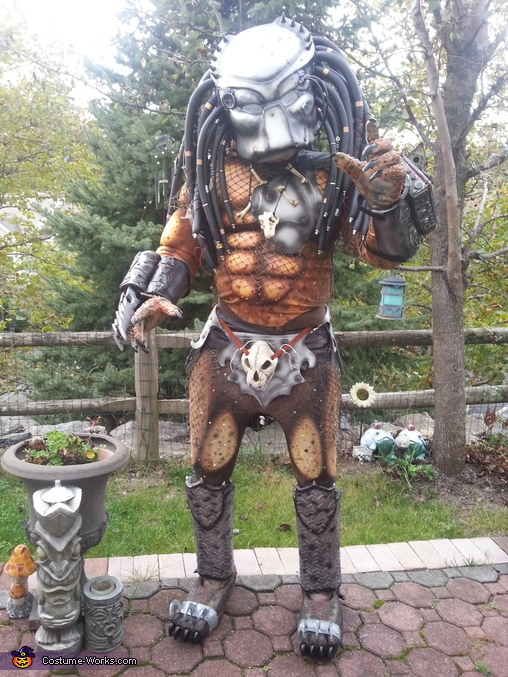 How I made the costume Step 1 I bought a rubies Predator mask I airbrushed it cut off the plastic dreads made dreads from backer rod from Home Depot painted them black with rubberized spray. I've been decorated them with various dread cuffs leather string feathers skulls Etc. Step 2 I bought a muscle suit from Party City I airbrushed it to look like real muscles I use colored glue sticks to give it texture. I did the same for the legs. On the legs I also put two pieces of foam to emulate muscles underneath the tights. I bought foam from Michaels and shaped them for all the armor pieces airbrush them. I also bought netting from Michaels and made The netting on the body. I bought rubber mats from Five Below to make the armor on the legs and I airbrush that. I also put foam over two boots and shaped it into feet airbrush that and I made a close on the feet out of jewellery clay also from Michaels. I then made the hands out of gloves from Home Depot I sprayed them and texture them with the colored glue and then I use women's nails and glue them on and painted them black. What you can't see is I also had a suede bag on my waist that had an iPod that was playing the Predator growl on a loop. I almost forgot I made the face mask helmet part also from rubies Irish sprayed it with sterling silver spray and airbrushed it I also put lights on the inside of the eye so they would flash and Tiny lasers for the laser part of the helmet with a magnet underneath the faceplate and inside the headpiece so the helmet would hold on. This costume was my best and most funniest one to make everyone I came in contact with loved it had people lined up 1015 deep just to take a picture with me everyone said how much they loved it it made me feel great. Win or lose I just wanted to share this with you thanks.